Check out the special attack called “Stand Over Here While You Do All the Work." During the original PlayStation era, Japanese game developer Square was the undisputed king of RPGs and action adventures on the console. Riding a giant wave of success from their Final Fantasy series, each year promised new entries in their most popular franchises. One of these releases is available on PlayStation Network as a PSOne Classic; Legend of Mana, the fourth in Japan’s popular Seiken Densetsu series (US gamers knew it better as the follow-up to the Super Nintendo title, Secret of Mana). Is this action-adventure quest worth a revisit in its unaltered original form or have the 10 years since its original release not been so kind? While there are plenty of various elements to grasp, Legend of Mana is essentially a hack-n-slash adventure with the main face buttons performing a strong and weak attack, jump and guard. You can equip special skills and magic spells to the shoulder buttons by accessing the main menu. Here you can customize your character’s attributes, equipment and assign newly acquired skills and spells as you progress. Successfully hitting enemies or blocking will build up the special meter to use said spells. The controls themselves are very simple, even more so than a traditional brawler. The combinations are not at all complex and single button presses for skills and spells makes dealing big damage and defense very easy. Sadly, the hit detection is not solid and the combat doesn’t flow perfectly, even in comparison to the game’s 16-bit predecessors. Also, menu navigation is rather complex and takes a while to learn your way around. While one can easily get sucked into the nature of a classic adventure game, today’s gamer will demand tighter combat and menus you don’t need to read a manual to navigate. The graphics of most PS1 games haven’t aged well with their blocky and muddy polygon textures and slow frame rates that may have impressed 15 years ago. However, Legend of Mana passes the test of time with its beautiful hand-drawn artwork that Square was known for once upon a time. Every town, character and enemy visually blooms with color and style. The 2D graphics with 3D lighting effect embellishment are far from being an eye sore. If the overly crisp “pixely” look is not to your liking, the PS3’s smoothing option works quite well on this title. Outdoing the visuals is the excellent musical score, which breathes most of the life into this title and is easily its best attribute. The mood and tone perfectly matches each scenario, which is also an old-school Square signature trait. The only element in the presentation that lacks is the character animations. Even for a game from the PS1 era, a little more fluidity would have made this look even better. For its time, perhaps the most unique aspect of Legend of Mana was the non-linear take on the action adventure by allowing the player to create and shape its world of Fa’Diel as they progress. During this quest, you will find “artifacts” that are to be used in the world map to unlock new towns, dungeons and other areas of exploration. You can place these artifacts anywhere you please on an isometric landscape map. Exploration of these areas in any order as you build opens a series of sub-quests that eventually complete various story arcs within the game. While it’s an interesting element to add to this type of game, the actual placement of the artifacts comes off more as aesthetic rather than effect the depth of gameplay. Even with variables such as mana ratings on land placement, the chore of creating your map reaps very little reward. There are plenty of side quests equipped with quirky objectives, but the game’s core story and characters lack depth as well. Oddly, they are simply vessels to encounter colorful NPCs as they run in and out of your adventure asking you to assist in theirs. Better hope your memory and attention are at their sharpest; quest objectives and locations are extremely vague with little to no reference as to what to do next. The one sentence diary entry in your menu doesn’t help much either. 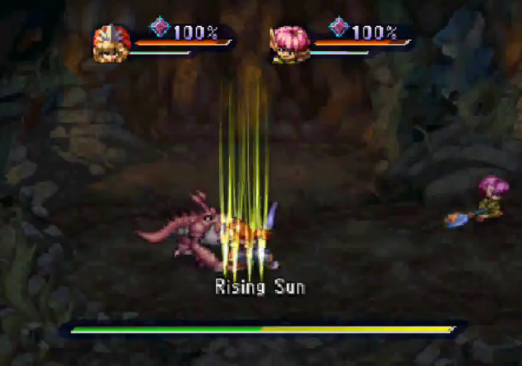 Luckily, Legend of Mana is still rather easy to navigate through. You’ll eventually go somewhere where monsters attack, you kill them, experience crystals and treasure are dropped, and that euphoria from satisfying your addiction of hack-n-slash adventure is fulfilled. While the main characters and story lack focus and soul, the world of Fa’Diel is captivating enough to press on. A multitude of weaponry each with the ability to level up and earn new skills can provide fun for completionists. I suppose my biggest criticism (the same I had from playing it years ago) is that it simply doesn’t hold a candle to the 16-bit classic, Secret of Mana. That game had multiplayer support for three, a simplistic yet enjoyable story and easy to grasp gameplay and combat. This followup has a convoluted menu, forgettable leads and a subdued two-player mode. As a standalone game, it’s a fair adventure, especially for the low price of $5.99. As a follow-up to an all-time SNES great, it’s still a bit disappointing. Over 10 years after its release, Square’s Legend of Mana proves to be a decent PSOne Classic available on the PlayStation Network. It’s not their finest hour and doesn’t live up to its predecessor, but the presentation still holds up and the simplistic quests may satisfy those hungry for an old-school adventure despite its flaws.